Hazel's Quilts: Christmas QAL - July pt4 - Brainteasers! What a lovely day this is turning out to be! 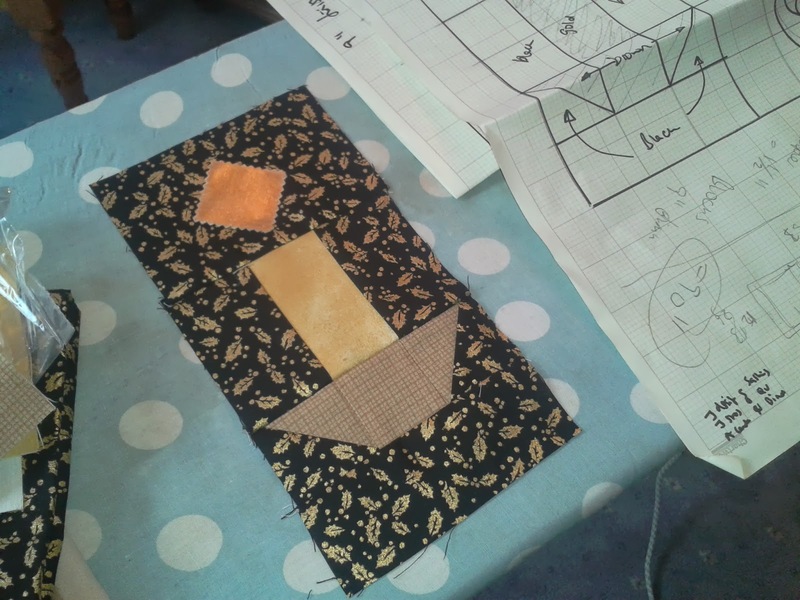 Such fun in the sun with Granddad George the Scarecrow, some piecing for my Christmas Challenge, and travelling around the world to see how my quilting buddies are all getting on! Brilliant! Let me show you my first block - well, it's half a block, really, but I was so excited to get the pieces together I've done one half rather than both. I love this, and hope when the other half is added that I'll love it even more! Right - I'd better get on with taking Granddad George to the allotment site and get him settled in the pumpkin bed to scowl at all the pigeons! I'll be back later - but to keep you out of mischief whilst I'm gone, I'm going to let you have a few QUIZ QUESTIONS of Christmas around the World! How many do you know, I wonder...? In which country are gifts bought to children on Epiphany Eve by a female Santa Claus named BEFANA ? In which language is Christmas referred to as NADOLIG ? In which German cathedral is there a shrine to the Three Wise Men ? What is GLOGG, traditionally served at Christmas in Sweden ? Which country in 1937 became the first to issue special Christmas greeting stamps ? BOAS FESTAS is the Christmas greeting in which language ? In which country is COUGNOU a sweet bread served for Christmas breakfast ? Where would you celebrate Las Posadas, a nine day Christmas celebration ? Eaten prior to the Christmas Eve meal in Poland, what is OPLATKI ? The Christmas tree in Trafalgar Square in London is an annual gift from the people of Oslo in Norway, when did this custom originate ? You made me work for this one! The only one I know is number 8, Mexico otherwise I am not to informed. I started working on my Christmas quilt and am pleased with what I am coming up with. 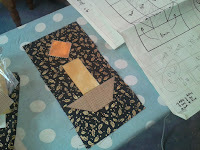 I wrote a poem to put on it as stitchery and it is directing the rest of the quilt and how its coming together. I am getting excited about it. Thanks for letting me join! I knew no.2 as I follow the blog of a lady in Wales who had a cat called Nadolig as he turned up Christmas! Looking forward to seeing your Christmas challenge - it sounds wonderful! The only one I knew was number 10 - it is to thank our country for support given during WWII. Didn't know that, Bilbo - but I did have an intelligent guess at no.6 as it looks a bit - but not quite - like Spanish. No. 9 is easy for me because we have Oplatek every Christmas Eve. It is the wafer we share with each other, reminiscent of the breaking of the bread at the Last Supper. I'm Polish on my Mom's side. I didn't know that one either, Joanna - colleague Rita knew no. 3, as she has holidayed on the continent quite widely. And I didn't know you had an Eastern European ancestry either. Have you ever been to Poland? Oh my, I don't feel very smart right now! I only knew #4, maybe because there was wine involved...giggle...Yay for Donna for finding out the answers! I'm stunned I didn't know it, what with the wine connection! I knew no. 4 involved alcohol and I knew the answer to the last one, but none of the others. I got hardly any - and they look so easy at first glance too!